Casting is a manufacturing process by which a liquid material is usually poured into a mold, which contains a hollow cavity of the desired shape, and then allowed to solidify. The solidified part is also known as a casting, which is ejected or broken out of the mold to complete the process. Imperial World Trade has partnered with casting foundries in Rajkot, to offer our clients top quality Graded & Steel Castings as per our clients drawing/samples. Forging is a manufacturing process involving the shaping of metal using localized compressive forces. Forging is often classified according to the temperature at which it is performed: "cold", "warm", or "hot" forging. We specialize in supplying custom forgings to major industries such as heavy equipment, oil field exploration/production, ship building and power generation. Our forgings are produced in a variety of materials and are tailored to each customer’s specific needs. 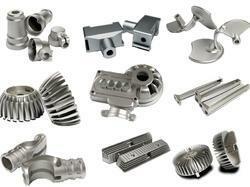 With the help of experts, our firm is capable to present Casting Parts in varied specifications. Experts manufacture this product by employing the advanced technology and optimum quality material that is attained from industry certified salespersons. Our presented products are immensely used by consumers owing to their longer life and precise sizes. 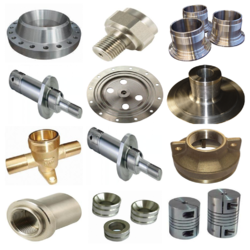 We are an eminent organization in this domain, engaged in providing our precious clients a superior quality range of Forged Components. These Forged Components are fabricated by utilizing high-grade metals procured from the well-known vendors of the industry. We feel pleasure to introduce ourselves as the foremost manufacturer, exporter and supplier of a wide gamut of Die Casting Component that are extensively used in automotive, engineering and other similar industries . Our provided component is manufactured with utmost care using the quality assured raw material and latest technology at our well-established production unit. The component offered by us is tested on diverse quality parameters by our quality auditors before delivering it to our clients' end. Aluminium: LM 4, LM 6, LM 20, LM 25, etc. Gun Metal: LG 2, LG 4 C, etc. Brass: SCB 3, SCB 1, etc. Bronze: PB 1, PB 2, LB 1, LB 5, etc. Bronze Gunmetal CastingHaving pre-set standards of quality administration, we have come up with a wide variety of Bronze Gunmetal Casting. We are exclusively engaged with our knowledge in manufacturing and supplying a wide variety of Grey Iron Casting. Offered casting is appropriate for different industrial sectors. This casting is manufactured using the top quality iron. Our casting is renowned for its high durability, available in various dimensions and sizes. Offered casting is available in the market at nominal prices. Gate Valve Castings offered comes in precision construction finish as well as with options of different surface finishing choices like polishing, heat treatment, painting, powder coating, anodizing, electroplating, mirror polishing. 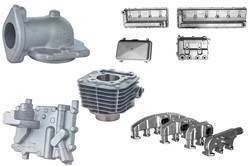 Here, our expertise lies in offering these castings in both standard as well as OEM finish configurations. Some of its features include available in both standard and OEM options; castings available in different design choices; stainless steel AISI304, AISI316 and other metal choices; allows for stronger forged cast/machined part; high-strength components; provides for economical performance. We specialize in manufacturing and supplying a wide range of Brass Casting Components. Our products are developed from finest quality metals and other components these devices ensure long functional life and durability. Following the demands of clients, we provide our components in various standard sizes, ranges and technical specifications. We offer our devices at market leading rates. 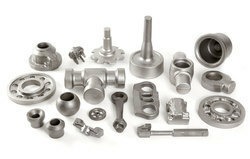 We supply a wide range of all type of SG Castings. We design these products on specific technical requirements of our clients. The products offered by us are designed keeping in mind the industrial standards and are offered at the reasonable price to our clients. 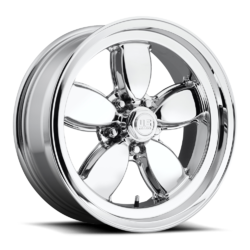 These are best known for high performance and low maintenance features. 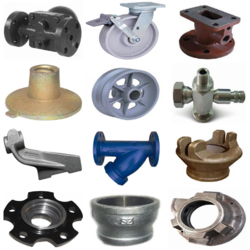 We are leading manufacturer and supplier of All Type Of Investment Casting Parts. and our product is made up of good quality. We are offering Lost Wax Casting to our clients. Price range may vary as per the quantity, weight & grade. We are leading manufacturer and supplier of Aluminium Casting and our product is made up of good quality. We are one of the premier manufacturers and suppliers of Aluminium Casting that is produced using graded metals namely Aluminum. Different specialized molding processes like pneumatic M/C molding, hand molding, and machine molding are employed in the production process. The team of qualified and adept experts puts in its efforts to bring forth precision engineered and highly ductile products. 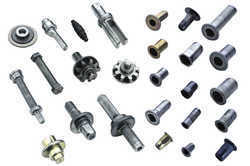 These are well appreciated in the market and used in the Automobile industry owing to their robustness and durability. We are successfully meeting the varied needs of our patrons by offering a wide gamut of Industrial Cold Forging as per their precise needs. The offered cold forging parts are precisely manufactured in different designs and sizes using high-grade basic material and progressive techniques. The use of cold forging process eliminates the need of machining process of parts. 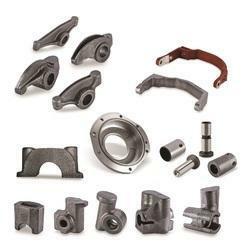 Our provided cold forging parts are broadly used in various industrial applications. Moreover, our clients can avail these cold forging parts from us at a market leading price. Imperial World Trade Rajkot, India is engaged in Industrial supplies can offer wide range of Hot Forging Parts Supplies from ready stock or on make to order basis.various steel products such as Angles, Channels, Beams, Billets, Blooms, Round Bars, Square Bars, Rectangular Bars, Flat Bars, Forged Bars, Rolled Bars, Concast Bars, Pipe Flanges, Elbow, Tee, Reducer, Cross, Stub End, End Caps, Forged Stampings, Pipes, Tube, Tubing, Fasteners, Bolts, Nuts, Washers, Screws, Studs, Plates, Sheets, Coil, etc. Specifications: Can offer Hot Forging Parts Supplies in normalized, annealed, spherodized annealed, quenched (hardened) tempered condition with black or bright (peeled or proof machined) finish. Size Dimensions: Client can avail Forgings, Forging Parts Supplies of thickness sizes ranging between 0.5mm upto 500mm depending on material grades technical specifications. 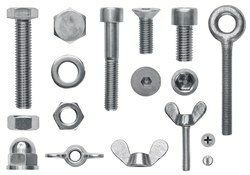 Client can avail Hot Forging Parts Supplies of diameter sizes ranging between 4mm upto 2500mm for flat bars thickness ranging from 0.1mm upto 500mm depending on material grades technical specifications which can be used for manufacturing of fasteners, hollow bars, forged seamless ring, forged flanges, tube pipe fittings, bolts, screws, round hexagonal nuts, washer, forging components, dies, etc. 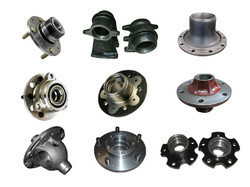 We stock, supply, export, wholesale Hot Forging Parts Supplies which are used in applications of Bridges, Engineering, Construction, Oil Field, Offshore, Shipbuilding, Nuclear Projects, Marine Projects, Medical, Instrumentation, Furniture, Boiler, Heat Exchangers, University student projects, etc. 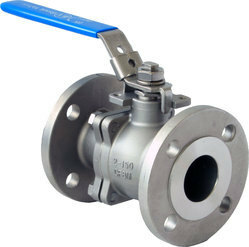 Ours is a trusted name in the market that involves in manufacturing and exporting Ball Valves Casting that can be obtained at reasonable prices. Manufactured using optimum quality raw materials, these castings are massively used in railway industries for air dryer system. 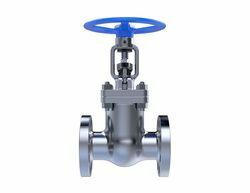 Ball valve castings are widely acknowledged for their rugged construction, longer service life and correct dimensions. Standards: AFNOR, ASTM, BS, CSN, DIN, GOST, IS, ISO, JIS, SI, SIS, UNI. Grades(IS): CI FG-150, Cl FG-200, Cl FG-260, Cl FG-300, Cl FG-350, Cl FG-400. we bring forth Ductile Iron Casting that finds a massive application for making motor blocks. Owing to the good tensile strength, elongation and high yield strength, the proposed selection is massively demanded in the business. Handed over in promised time, the offered series of castings is checked on multiple parameters, to make sure of the quality. Grades(IS): SG 350/22, SG 400/18, SG 450/10, SG 500/7, SG 600/3, SG 700/2, SG 800/2, SG 900/2. Looking for CASTING AND FORGING ?